This blog is for a class project, where I will be discussing Canada's convergence of the Telecommunications Industry and how it affects us, the Canadian citizens. The Canadian telecommunications market is dominated by massive cross-media owning companies such as Rogers, Telus, Bell and Videotron, and I believe they are responsible for the outrageous high prices Canadians have to pay for their services and is shown in global statistics with the highest average revenue per user (ARPU) measured by smartphones per capita, with companies making $60.79 per user (Geist, 2013, Canadian Players Enjoy… para. 1). As you can see from this graph (Nowak, 2013), Canadian telecommunications companies make significantly more then most countries, and makes 76% more revenue per month than all of Europe ($27.02). In 2000, the top 3 wireless providers – Bell, Rogers and Telus – accounted for 87% of the industry and today now account for just over 93%, that is massive. The only company out of these big three that does not have a major hand in the other telecommunications sectors is Telus, where Bell and Rogers now have major market share in every other telecom-media-internet industries (Winseck, 2012). Between 2000 and 2010 using the Herfindhahl – Hirschman Index (HHI) we can map out just how concentrated the market is. The basic rule with the HHI is that scores under 1000 indicate reasonable competition, 1000-1,800 moderate levels of concentration and anything over that, high levels of concentration. They’ve been over 3000 for most of the decade (Winseck, 2012), clearly indicating how highly concentrated the industry is. The Canadian Radio and Telecommunications Commission should be given more power in regulating the industry being backed by the Federal government to monitor and enforce the regulations set up by the CRTC. Dominant incumbent players use price (usage billing) and bandwidth caps, for example and among other tactics, to protect their legacy television businesses (i.e. CTV, Global, CityTV, TVA etc. ), while hobbling rivals (Netflix) and limiting people’s choice as a result (Winseck, 2012). 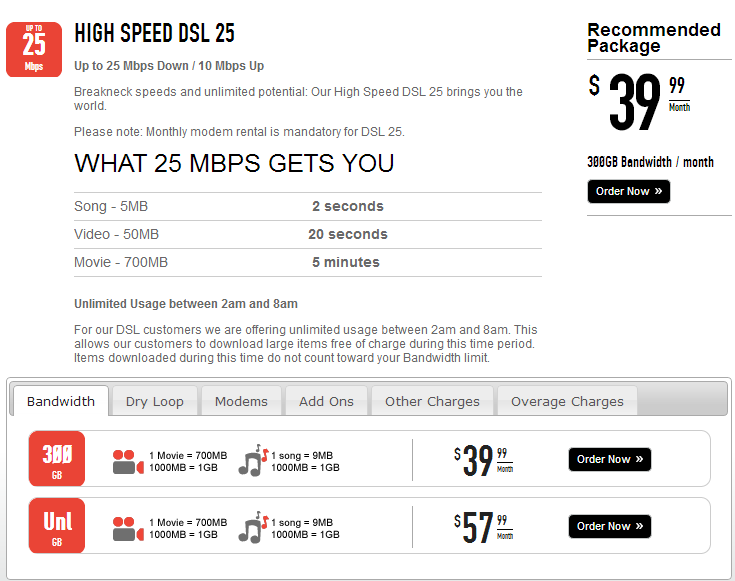 Bell versus Teksavvy’s prices and GB caps for Internet packages. The major differences between the two are, with TekSavvy’s $39.99 plan, you get a 300GB cap on Internet streaming, while at Bell what you pay around $5 more for an Internet package plan, you are only getting a 75GB cap. Despite the Act that was finalized in 1993, the CRTC is not given enough resources to keep up with the advancements in technology and their effects on the industry. Thus, this has led to the industry leaders guiding and telling the regulators what they should do. Even when the CRTC gives regulatory decisions, it is usually overruled by the Federal government in favour of the big companies lobbying for a certain decision. Counteract efforts by new or recently established service providers to attract customers. Reduce the incentive for established service providers to discount their prices and innovate. If only a small portion of wireless consumers have the ability to switch service providers at a given point in time, then a strategy of lowering prices, innovating or otherwise bringing competitive forces into the market may be less profitable or appealing. The competition Bureau also notes that Canada is the one of the only countries left still using three year contracts, in the US it is normally two years and in Europe three year contracts are prohibited and supports changes to limiting contract durations. Not only do we still have these restricting three year contracts, the big wireless companies charge their subscribers 75 cents per month for enhanced 9-1-1 services. But WindMobile told the CRTC during the consumer wireless hearings, the actual cost for this E-911 service is closer to ten cents. WindMobile pays for this service for its subscribers, so if incumbent players are charging 75 cents when its really only 10 cents… Incumbents are making 65 cents profit per user per month and they roughly have about 25 million subscribers in total. This equates $180 million in annual revenue after costs are covered (Geist, 2013). On top of this, Canadians pay the most for roaming charges. A 2011 OECD study found that Canadians pay the most in the world with an average of $24.61, the OECD average was $9.48. Furthermore, Bell tried to argue that to have mandatory unlocked phones, this would not allow us to get phones as fast as other countries or not at all. This was quickly dismissed by JF Mezei of Vaxination Informatique in his submission to the CRTC where Hong Kong (which requires unlocked handsets) was apart of the original list for the iPhone5 launch date (Sept. 21) and Italy and Finland (which also require unlocked handsets) got them a week later (Sept. 28) as other western European countries. Bell and Rogers charge a $75 unlocking fee ridiculous for even Telus as theirs costs only $35, adding onto the additional costs and locking consumers into high roaming fees. In addition to all of these hidden fees, Canadian mobile data speeds are far slower than many peer countries, even when Canadian wireless providers are bolstering their new LTE networks. In this CRTC 2012 Communications Monitoring Report, it shows that we us to have the fastest speeds compared to any of these countries, but now are badly trailing behind other with a 64% drop in speeds. I am not sure why this is, but this needs to be looked into. There is some hope for us Canadians though, a great site for issues relevant to the telecommunications industry and a way to democratically fight back is Openmedia.ca. Here, they provide information on all things digital, from cellphones and Internet, to copyright and intellectual property, and how International, National, Regional bodies can affect the way we live. For example, OpenMedia, in an ongoing petition called Demand Choice, it seeks to stop the Rogers takeover of Shaw’s public assets that they obtained at a premium and that were set aside for independent providers. OpenMedia provides an excellent way to actually participate by having pre-written messaging being sent to The Industry Minister Christian Paradis’ email (in this case) by just typing in your first and last name, email, and Postal Code. The Demand Choice petition currently has 33,122 people (and counting) who have sent an email to the Industry Minister. So what are you waiting for! Go to OpenMedia.ca, DemandChoice.ca and StopTheTrap.net and advocate for a more fair and competitive market!